Modern life makes it very difficult for us to keep our body and mind in good shape. There are many real or imagined reasons not to follow a regimen of right food and enough exercise. And, then, there are those delicious sugary treats! As it turns out, keeping in shape is easier than you might think. In this article, we will review some simple exercises that you can do at home, to get your abs in top shape. To be able to follow your progress, before you start exercising, stand up and measure your waist at belly button level. As a reference, for a healthy woman, her girth should be around 35 inches. After exercising for a week or so, measure your girth again and see if you’ve made any progress. Lie on the floor, knees bent, feet flat, hands behind your head without interlocking your fingers or pulling your head up, elbows extended to the sides. Push your lower back into the floor, to tighten the abs. Tilt your chin a bit, to leave only a few inches between the chin and the chest. Bring your shoulders up until you have a gap of four inches to the floor. Your lower back should stay flat on the floor. Hold the position for a second or two, then roll your shoulders slowly back down on the floor. 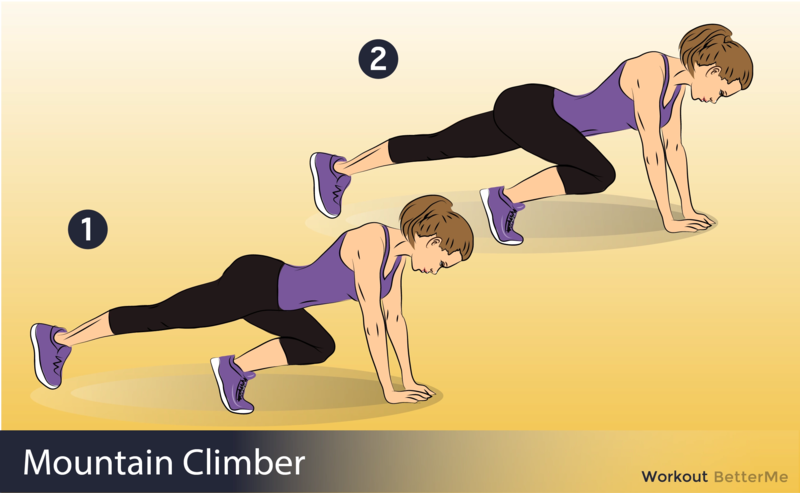 Start from a push-up position, hips raised high, hands flat on the floor, at shoulder width, back straight, feet apart at more than shoulder width, only toes touching the ground. Keeping your legs straight, push your chest forward and pull your head back, looking up. Your hips should start lowering towards the floor. Keep going until your hands are straight again and your back is arched backwards. Go back to starting position by raising your hips, lowering your head and straightening your back. Stand tall, feet hip-width apart. Squat, placing your hands flat on the floor, in front of you. Push your legs backwards with a jump, arriving into plank position. Push up, pull your legs back in under you with a jump, then stand up. Start from a push-up position, hands flat on the floor, at shoulder width, only the toes touching the floor. Pull one of your knees in, towards your chest and opposite elbow. Keep your body and the other leg straight. Push your bent leg back to starting position. Repeat with the other leg. Stand tall. Lower yourself into a normal squat, then tighten your abs and jump up, extending your arms upwards, on the sides of your head. When you touch the floor again, don’t stop, but go back down in squat. Repeat. If you can, use a bench in order to extend your legs range of motion. Lie on your back on the bench, legs hanging over the edge. Put your hands under your buttocks, palms down. Straighten your legs and slowly raise them until they are perpendicular to the floor. For added resistance, hold a dumbbell between your feet. Hold the position at the top for a moment, then lower your legs back to the floor. Lie flat on your back, arms extended to the sides. Raise your legs straight until they are perpendicular to the floor. 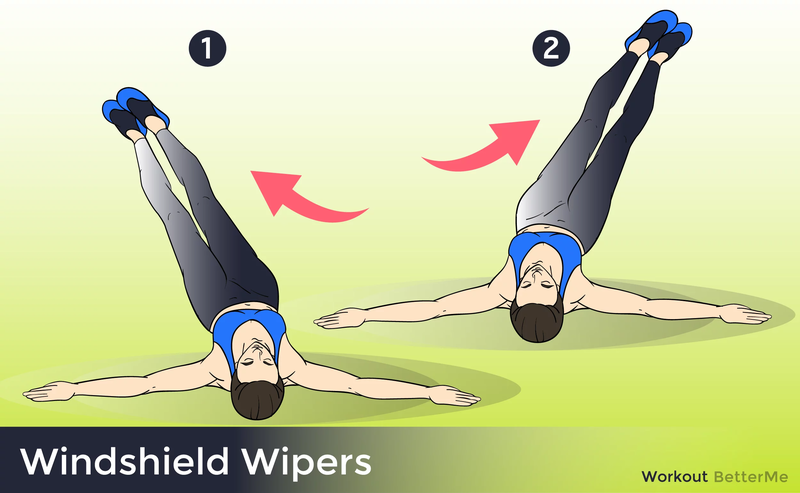 Start tilting them together to one side, then to the other side, like the motion of the windshield wipers. Initially you can tilt only about 45-degrees on each side, but later you can go down all the way to the floor on both sides. Lie on your stomach, face down, arms and legs extended, neck relaxed. Lift your arms and legs towards the ceiling, while keeping your hips and stomach flat on the floor. Hold for 3 to 5 seconds, then lower them back to the floor. Lie flat on your back, hands under your buttocks, palms down. Keeping your knees together, pull them in, towards your chest. At the same time, raise your head and shoulders towards your knees. Hold for a moment, then return to the initial position. Supporting yourself on your elbow, lie on your side, with your body straight, legs stacked. Stay in this position for as long as you can. Don’t let your hips drop. Repeat on the other side. Stand tall, legs straight. Bend over from the hips, until you rest your palms flat on the floor. Keeping your legs straight, walk your hands away from your legs. When you reach the maximum length, start walking your legs towards your hands, in small steps. From push-up position, lower your elbows and forearms flat on the floor. Keep your body straight from shoulders to ankles. Support your weight on your toes and forearms. 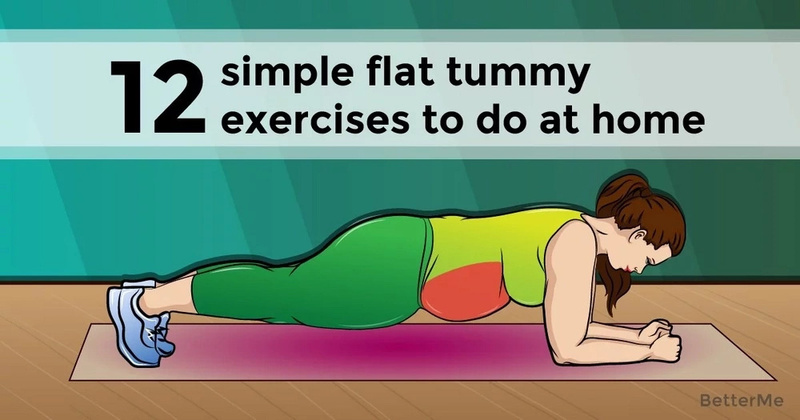 Pull in your belly-button to tighten your core. Hold the position for as long as you can.